In the summer I envision hot, sunny days poolside. Unfortunately, Mother Nature isn’t always having the same dream. Luckily, there are many great indoor places for your little one to play in our community. But, if you want to strikethrough some items on your shopping list and mix in some fun with your kiddos, Market Place Mall can do that for you. Champaign’s mall is located at 2000 N. Neil St. in the heart of the North Prospect Avenue metropolis. Visit Monday through Saturday from 10 a.m. to 9 p.m. or on Sundays from 11 a.m. to 6 p.m. If I intersperse my shopping with an activity for my little one, it’s a win-win and a much more enjoyable outing for everyone. With this strategy in mind, here’s my list of fun things to do at the mall when your little ones are in tow. 1) When I saw the Fun Rides cruising around the mall, I couldn’t resist. They are so ridiculous, weird and oddly fun. 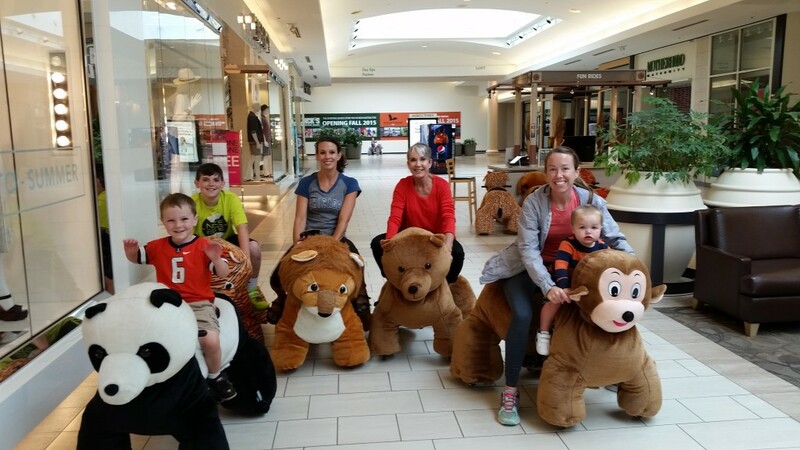 These giant motorized stuffed animals are available for rent at a kiosk near the old Sears. You can choose from a dozen or so different four-legged animals. Rent them for 15 minutes for $7 or 30 minutes for $12. All children younger than 4-years-old and/or under 37 inches tall have to ride with an adult (best excuse ever to unabashedly jump aboard one of these bad boys). You can’t enter any stores, food court or outside, and all children need to be with an adult. The weight can’t exceed 300 pounds. They go at a pace somewhere in between leisurely stroll and power walk depending on the amount of weight the animal is carrying. When you make your payment (they accept all forms of plastic) look at your phone, and just make sure to come back after your allotted time. The animal won’t shut down automatically after time is up. Music comes from the rear of some of these animals, so pick wisely! My son was over it after a few minutes, but I made him stay on because I was enjoying the ride so much. There are little cars, too! 2) The Tot Lot (by JCPenney) is a FREE destination for those kids who are 42 inches and under. Although, you are going to see some rogue big kids barreling through your little ones. If it’s a calm day (which it isn’t if it’s raining) this is a nice place for kids to burn off steam. There are bright, squishy structures for kids to jump on, over and under. The lot even has a large TV, slide and some interactive games. Right outside the play area you will find coin-operated riding toys like buses and cars. 3) I love the magic of a carousel. There’s nothing like bright lights, creepy circus music and costumed animals on poles spinning round and round and round. They make me super nauseous, but my son loves them. One ride costs TWO dollars. However, on the first Friday of each month (from 5-8 p.m.)—the rides are free. Unlimited! Plus, entertainment and retailer deals! You can’t miss the carousel, for it’s located in the food court. 4) Admire Glen C. Davies murals when you inevitably have to make a bathroom stop at either the food court or by the JCPenney entrance. The murals feature animals, books, butterflies, bright skies, green grass, happy trees, hot air balloons and flowers. If you keep looking, you keep finding new details. Take a moment and dive into the paintings. You may discover a mouse with a picnic basket, a heart carved into a tree or a spider in a delicate web — little moments you may have missed at first glance. His style is obvious and identifiable: colorful, bold, happy and youthful. 5) You may be shopping with a kiddo little enough to fit in a stroller. If that’s the case, lighten your load and leave your stroller at home. For $5 (you get 50 cents back if you return) you can rent a fire truck stroller at one of the chutes by the JCPenney entrance or food court. Just the novelty of it seems to delight the passengers and keep them more engaged on your shopping adventure. 6) Make a wish in the food court fountain that benefits Habitat for Humanity. Plop in a coin while wishing for a peaceful shopping experience! Make sure to keep a hold of your child’s waistband — my son almost went for a swim. 7) You will find a photo booth close to Fun Rides by the old Sears. Pay $5 and get a column of shots to take home. 8) Get a massage. Ahhhhh, time for a break! Sit you and your little one in a massage chair by the Tot Lot in the JCPenney wing. These delightful massages cost $1 for three minutes. You can pay up to $20 for one hour! There are also games in the food court and candy machines around every corner. These just aren’t my favorite distractions! But, whatever works for you! Take my advice: make the mall a rainy day destination. Window shop, buy some goodies, get some lunch and experience a new adventure at an old favorite.